In Brief: Detective Rebecca Madsen and Alcatraz historian Doctor Diego Soto team up with a secret agency that is dedicated to finding and catching inmates from the infamous prison who went missing 50 years ago and are reappearing today. The special task force includes Emerson Hauser and Doctor Lucy Banerjee. From executive producer J.J. Abrams (FRINGE, “Lost,” “Star Trek” and the upcoming “Mission: Impossible – Ghost Protocol” and “Super 8”) and writer and executive producer Elizabeth Sarnoff (“Lost,” “Deadwood”) comes ALCATRAZ, the chilling new thriller centered on America’s most infamous prison and one-time home to the nation’s most notorious murderers, rapists, kidnappers, thieves and arsonists. When San Francisco Police Department DET. REBECCA MADSEN (Sarah Jones, “Sons of Anarchy”) is assigned to a grisly homicide case, a fingerprint leads her to a shocking suspect: JACK SYLVANE (guest star Jeffrey Pierce, “The Nine”), a former Alcatraz inmate who died decades ago. Given her family history – both her grandfather and surrogate uncle, RAY ARCHER (Robert Forster, “Jackie Brown”), were guards at the prison – Madsen’s interest is immediately piqued, and once the enigmatic, knows-everything-but-tells-nothing government agent EMERSON HAUSER (Sam Neill, “Jurassic Park”) tries to impede her investigation, she’s doggedly committed. 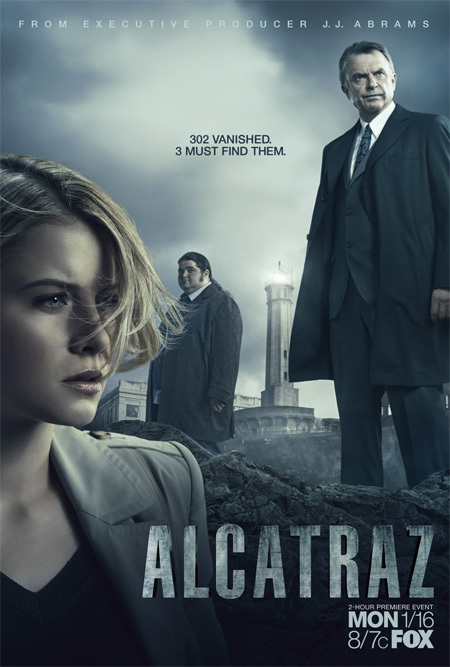 Madsen turns to Alcatraz expert and comic book enthusiast, DR. DIEGO “DOC” SOTO (Jorge Garcia, “Lost”), to piece together the inexplicable sequence of events. The twosome discovers that Sylvane is not only alive, but he’s loose on the streets of San Francisco, leaving bodies in his wake. And strangely, he hasn’t aged a day since he was in Alcatraz, when the prison was ruled by the iron-fisted WARDEN EDWIN JAMES (Jonny Coyne, “Undercovers”) and the merciless ASSOCIATE WARDEN E.B. TILLER (Jason Butler Harner, “The Changeling”). Madsen and Soto reluctantly team with Agent Hauser and his technician, LUCY BANERJEE (Parminder Nagra, “ER”), to stop Sylvane’s vengeful killing spree. By delving into Alcatraz history, government cover-ups and Rebecca’s own heritage, the team will ultimately discover that Sylvane is only a small part of a much larger, more sinister present-day threat. For while he may be the first, it quickly becomes clear that Sylvane won’t be the last prisoner to reappear from Alcatraz. Through the course of the investigation, Madsen and Soto will learn that Agent Hauser has known about the prison’s secret history and has been awaiting the prisoners’ return. Soto will witness his life’s work – the history of Alcatraz – come alive. Madsen will be forced to keep her supportive San Francisco cop fiancé, JIMMY DICKENS (Santiago Cabrera, “Heroes”), at arm’s length from the highly classified assignment as she sees everything she thought she knew about her family’s past shattered, all while fighting to keep the country safe from history’s most dangerous criminals. PRODUCTION COMPANIES: Bad Robot Productions, Warner Bros. Television, Bonanza Productions Inc.